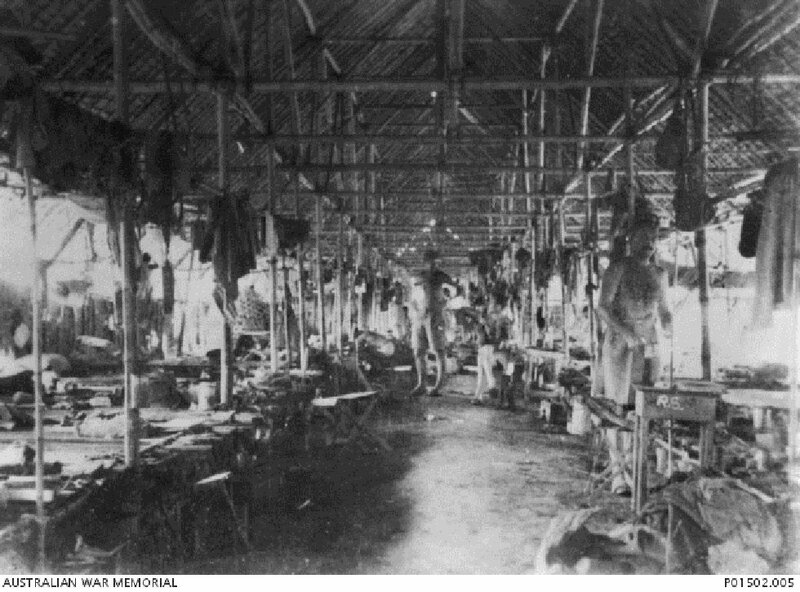 POWs in their quarters in an attap hut in Kanburi POW Camp. Belongings hang in bags from the rafters, through POWs sometimes strung wires for secret radios, 1944. Image courtesy of John Munslow Williams, Australian War Memorial. At parade on or about 27 Sept 1944, Shimojo struck Captain Taylor with his scabbarded sword because Taylor moved his foot on parade in order to ease the pain of an ulcer. Taylor was struck unconscious, and suffered a broken left arm and severe bruises of the upper arm, shoulder and ribs. Taylor was laid up for 2 months. 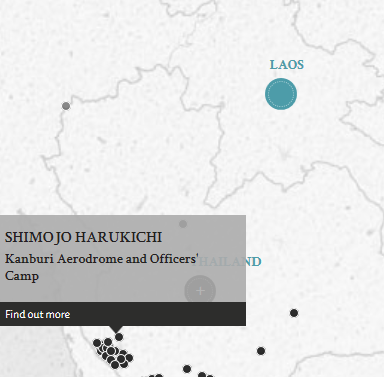 Between 1 Jan and 30 June 1945, Shimojo beat 5 British prisoners-of-war for various reasons. Shimojo was subsequently sentenced to death by hanging at the Australian War Crimes Court. Shimojo, Harukichi. Sergeant Major. From Japanese military. From Japan. Guilty. 4 years' imprisonment. Sentence reduced. 1 year imprisonment with fine. Le Gallais, R. L. Lieutenant Colonel. From British military. Courst president. Barrister-at-Law. Bains, N. S. Major. From British Indian Army. Busfield, K. R. Captain. From British military. Thomas, P. M. Major. From British military. Saeki, Kinji. Judge, Hiroshima Court. Hassan, Taufiq. Captain. From British Indian Army.